PM's presence at inauguration of Brazilian president Bolsonaro uncertain following coalition's decision to go to early elections. Israel’s Prime Minister Binyamin Netanyahu may cut his five-day visit to Brazil short over the political developments in Israel. Both Israeli and Brazilian media reported on the possibility of a shortened trip on Tuesday evening, more than a day after the ruling coalition agreed to dissolve the government and go to early elections. Netanyahu’s visit centers on the inauguration of Jair Bolsonaro as Brazil’s new president on Jan. 1 in the country’s capital city, Brasilia. His presence at the ceremony is now uncertain due to the likely changes in the agenda, yet to be confirmed. 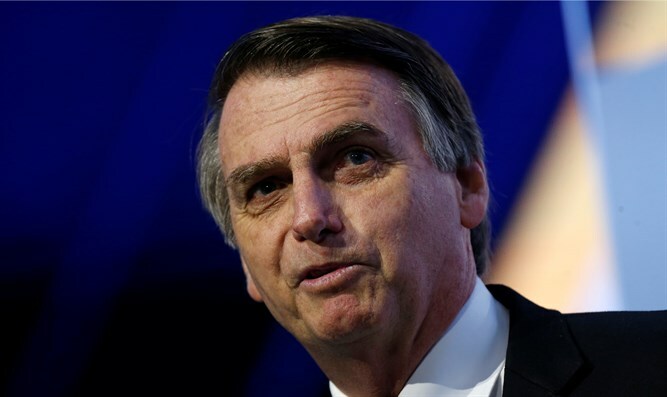 The historic visit – the first of a sitting Israeli prime minister to Brazil – is considered strategic because both leaders will discuss face to face the details of the transfer of the Brazilian embassy from Tel Aviv to Jerusalem, one of Bolsonaro’s flagship promises during his campaign. Netanyahu is scheduled to land in Rio on Friday, where he will be the first and only foreign leader to meet with Bolsonaro before he is sworn in next week. After the private bilateral meeting, Netanyahu will attend an afternoon service at a synagogue in Copacabana. He also is scheduled to meet Evangelical Christian leaders on Sunday, when he will fly to Brasilia or to Tel Aviv, depending on whether the visit is shortened. “The visit will bring an important political message: a turnaround in Israel’s relations with the largest country in Latin America. We are turning Israel into a rising world power,” Netanyahu tweeted on Sunday. The much-awaited trip marks the end of an era of strained ties between Brazil and the Jewish state.